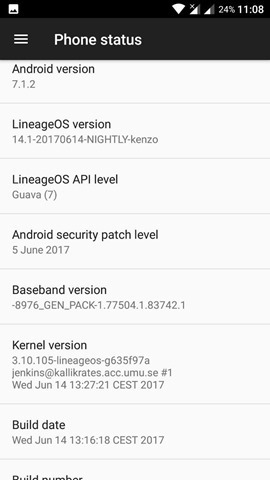 I have been using LineageOS on my Redmi Note 3 (Kenzo), ever since the first official nightly ROM was released. While it works fine for the most part, I recently ran into some errors when I tried to update it. Usually, I do not use the built in updater in the ROM, but use a delta updater app, such as Lineage Downloader or CyanDelta (my favorite one). But the latest ROMs were not updating automatically, when the phone was rebooted to the TWRP recovery. When I manually tried updating the phone with the downloaded update, I was greeted by a Status 7 error which said that the modem could not be verified, or something like that. Efforts to manually update the OS, by downloading the full ROM zip were met with a similar result. After a bit of digging through, I found that the ROM maintainer, added the modem verification thing in the ROM's builds recently. This meant, that the ROM file would not be flashed by the recovery, if the script which checked for the modem version, found a mismatch. But, you can fix it with a simple solution. This guide assumes you have installed LineageOS 14.1 on your Redmi Note 3, and want to update it. If that is not the case, please do not follow these steps. 1. Download the new unlocked bootloader zip file from XDA. This is the 6.7.6 firmware from MIUI, and is required for all LineageOS builds which were released after 3rd May 2015. 2. Reboot to TWRP and flash the zip file. 3. Now, try updating the phone with the latest LineageOS 14.1 zip file. The update process will work without any issues, as the script check for the new modem will pass. Also, make sure you are using the latest version of TWRP and LineageOS. This was tested on the Redmi Note 3 Kenzo variant.